After the KT-9 beaterless kick pedal, Roland presents the FD-9, an innovative Hi-Hat control pedal for quiet night practice on electronic drums. Roland presents the KT-9, an innovative beaterless kick pedal for quiet practice on electronic drums. A live demonstration of the Nord Drum 3P at the Musikmesse 2016. Clavia presents the new Nord Drum 3 and compact Nord Drum 3P, combining the heritage of the Nord Drum 2 with added features. Sunhouse presents Sensory Percussion, a new product that promises the nuance and control of an acoustic drum with the possibilities of digital sound. The Aerodrum developer team announces the release of an update that adds new playing options to the virtual drums/controller. 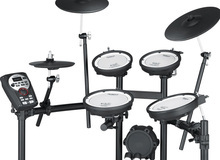 Korg did not forget drummers and introduces today a big egg that allows for drummer anywhere they go.